Established in 1910, the Garland District began to come into its own by the late 1920’s, according to the Garland Business District website. As the community developed a new business would eventually become an iconic fixture in the district for decades to come; the Milk Bottle. SPOKANE, Wash. — It is arguably one of the hippest neighborhoods in Spokane. The Garland District caters to those seeking eclectic art, an understated watering hole or a retro movie. The businesses in the Garland District and the people who support them have anchored the community over the years. The giant milk bottle atop the aforementioned Milk Bottle restaurant and ice cream shop is eye-catching. Built in the 1930’s, the actual milk bottle was for the Benewah’s Creamery chain. The old-fashioned ice cream shop would eventually be known also for their burgers and homemade milkshakes. Tom Ritchie's parents owned the Milk Bottle for 20 years before passing it on to him. Ritchie worked for the family business on and off for ten years prior to taking over. Established in 1910, the Garland District began to come into its own by the late 1920’s. "It means a lot to the community that we keep that going,” Ritchie said. And it was not easy to keep the business going after a fire in 2011. Both the Milk Bottle and Ferguson’s next door caught fire. Extensive smoke and water damage forced the Milk Bottle to be closed for months. Ritchie said they were not sure if customers would come back after being closed so long, but people did go back. "It took a lot of work to get it back up and going,” Ritchie said. Another staple of the Garland District is the theater. 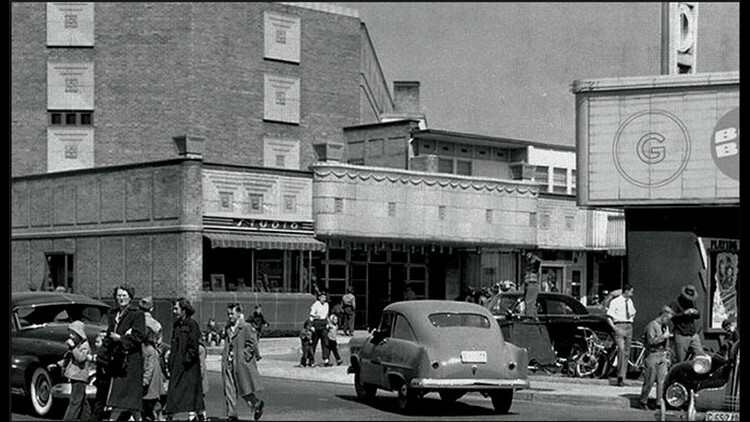 The Garland Theater was built in 1945 and it was the place to be. "It was one of the premier movie theaters in the Pacific Northwest,” Garland Theater General Manager Tana Sawyer said. Today, it is still the only independently-owned theater in town. And it has been source of entertainment for years showing big blockbuster movies, hosting film festivals and screenings. "Meeting people that have just grown up at the theater and love the theater and so that is a very personal thing to be a part of,” Sawyer said. As some businesses stand the test of time others are just getting started. The North Hill restaurant and bar is new on the block. The North Hill opened up in November 2018 on the bottom floor of the former Masonic Lodge on West Garland Avenue. The building was built in the early 1920’s. "We love the North Hill District, we love this area, and so taking an old building like this and bringing something to the community was something we are passionate about,” North Hill Co-Owner Keith Riddle said. Riddle said he and his business partners purchased the building four years ago. They renovated it, but wanted to keep the rustic, lodge feel. The North Hill offers a quaint dining environment with upscale, affordable pub food. Before opening the restaurant Riddle already lived and worked in the Garland neighborhood. He said what he appreciates about the district is the community. "I feel like the people who work here, also live here and people that live here really support this district,” Riddle said. Business owners agree that it is the people who live, work and play in the Garland District that have made it what it is and what it continues to be.